2005 CORVETTE - Spike TV's "Top Ride of 2005"
The 2005 Corvette drove away with the top honors winning the car of the year category, “Ride of ’05" at Spike TV’s AutoRox, the first ever nationally televised auto awards show. Hosted by Carmen Electra and Joe Rogan, AutoRox honored and celebrated America’s passion for the automobile. The 90-minute show, taped at the Barker Hangar in Los Angeles, aired TUESDAY, JANUARY 25, 2005 on Spike TV. 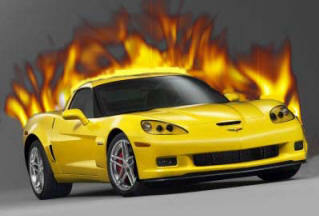 CORVETTE 2005 PRODUCTION CONTINUES TO SEPTEMBER!!!! GOOD NEWS! GM has decided to extend the 2005 C6 production of coupes and convertibles past the usual fourth week in June ’05 cutoff. Due to pent-up demand for convertibles the decision to build 2005s until mid-September is welcome news. Members we have received your e-mails of frustration in wondering when your convertible order will be built. The information we have is that currently the plant has only been able to build FIVE (yes, we said five!) convertibles per day. The current mix has been ONE power top and FOUR manual tops per production day. ALL are currently being built with black tops ONLY. But there’s hope! Very soon, convertible production should ramp up to nearly 45-50% of the daily out-put at our beloved C6 Corvette Plant. All top colors will be available and there should be no delay for those of you who have ordered power tops. One thing we do know is that Wil Cooksey (plant manager) will NOT settle for shipping any C6s that are not up to his personal high standards. And if you’ve ever met Wil, you know these are the highest standards we know of in the production world. To everyone who has been waiting for your convertible to be build, we assure you that when you sit in yours, it will be “ALL SMILES”, well worth the wait. Corvette is nominated in several +categories as part of the upcoming “AutoRox” awards show to be featured on Spike TV on Jan. 25 at 9 p.m. ET.”“The Ride of 05” and”“Maximum G Sports Car 2005” are just two of the categories in which Corvette has been nominated. QX1 Competition Gray Wheels now available to order! Chevrolet is pleased to announce the addition of a third wheel option for the 2005 Corvette. In addition to the standard Silver painted 5-spoke QG6 and the Polished 5-spoke QG7 will be a 5-spoke "Competition Gray" painted wheel. 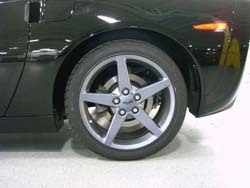 Competition Gray is similar to the racier look of the C5 Corvette Z06 wheel. The new Competition Gray wheel is now available by selecting Option Code QX1. A $295.00 additional charge will apply. DETROIT – The brand-new Corvette C6-R race car will debut at the 12 Hours of Sebring in March 2005 after a full year of rigorous testing and development. The two-car, factory-backed Chevrolet sports car program will compete in the production-based GT1 class (formerly GTS) of American Le Mans Series as well as the legendary 24 Hours of Le Mans in France, a race where the Corvette has won its class for three out of the past four years. The new race car is the most technically advanced sports car ever developed by General Motors, culling years of experience from the dominant Corvette C5-R as well as the advancements brought forth from the next-generation Corvette C6 and Z06 production models. Like the C5-R before it, the Corvette C6-R starts from production roots: the same hydroformed frame rails that roll down the assembly line at the Corvette plant in Bowling Green , Kentucky are sourced for the structure of the race car. With the new C6 production model measuring shorter in overall length (but with a longer wheelbase), race car engineers faced a new set of numbers in which to achieve their goals to make the car faster on the 180-mph Mulsanne Straight at Le Mans and other high-speed circuits. Adding a rear wing and a front splitter enabled the team to develop a package that achieves a lift-to-drag ratio better than that of the C5-R. Through a combination of Computational Fluid Dynamic studies and on-track testing, the end result will be an aerodynamically balanced package, tunable to the low drag demands of Le Mans or the high downforce requirements of Mosport. 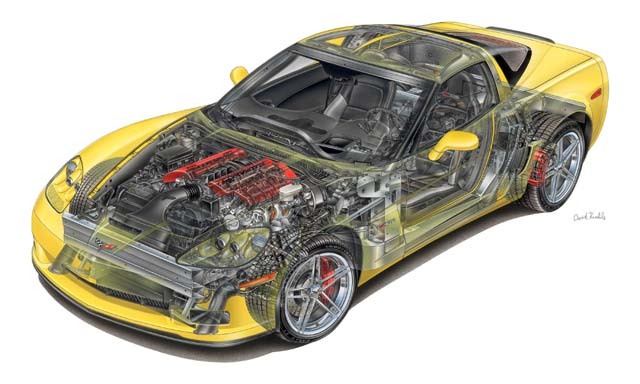 The phrase “technology transfer” has never been more appropriate than when used to describe the matched set of Corvette C6-R and Corvette Z06. Lessons learned on the track have benefited the Z06, just as GM’s vast resources have enriched the C6-R race car. Both cars are powered by 7-liter small-block V-8 engines with dry-sump lubrication systems, CNC-ported cylinder heads, titanium valves and connecting rods, forged steel crankshafts, and plate-honed cylinder bores. While the components and specifications of the street and competition engines are tailored to their specific environments, the thought process behind them is identical. The same six drivers that piloted the C5-Rs to an historical undefeated season in 2004 will return to the track in 2005: Ron Fellows, Johnny O’Connell and Max Papis will drive the #3 Corvette C6-R and Oliver Gavin , Olivier Beretta and Jan Magnussen will drive the #4 Corvette C6-R. HAPPY NEW YEAR C5/C6 REGISTRY MEMBERS! We couldn't believe it, but guess what we found in our mailbox, the February 2005 Motor Trend magazine. An article called "2006 Chevrolet Corvette Z06 Under the Spotlight" on pages 52-57 indicates that 2005 is going to be a fabulous Z06 year! We were pleasantly surprised to find six full-color pages of detailed information about our favorite American Sports Car, the 500 HP Z06 for 2006. Motor Trend's article by Frank Markus is very detailed regarding the improvements the Z06 edition brings to the table. According to Markus, the rumored all ALUMINUM chassis is for real weighing in at a total curb weight of 3,150 pounds. It will have a 7 liter (LS7) engine producing at least 500 hp with approximately 475 pound-feet of torque. This bad boy will be able to rev up to 7,000 rpm! 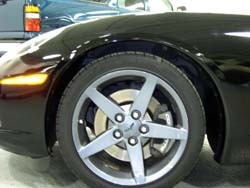 Rear quarter panels are 1.5 inches wider to clear the wheels that are 2 inches wider than the base C6. Fresh air comes in through a new hood nostril. Front grill has a 30% larger opening. New fender lips direct air around the wide front tires. Carbon fiber front fenders are larger and have a functional air exhaust scoop built within them. Larger CHMSL spoiler on top of the rear bumper reduces lift. Six piston front calipers clamp down on 14.0 x 1.3 inch rotors. Four piston rear calipers clamp down on 13.4 x 1.0 inch rotors. Z06s balsa wood floor is encased in carbon fiber. Z06 steering wheel is 0.8 inch smaller in diameter. The Z06 does NOT have a removable roof. The magnesium structure for the roof is bolted on permanently. LS7s exhaust system has the ability above 3500 rpm at wide open throttle to allow for a straight-through flow. LS7 was designed with a twin pump dry sump lubrication system. LS7 will have titanium valves and connecting rods, forged-steel crank shaft, pressed in iron liners into the block and extra-short pistons that require the steel liners to have "skirts" on them because the pistons protrude so far down into the block. Z06 is anything but a stripped race car. Its standard equipment says "loaded" with A/C, head-up display, Bose system, heated seats, side air bags and, get this, even a Homelink system. According to this article, this Z06 was designed to be a Dodge Viper Slayer and a stealth weapon against Ford's GT Super Car which will cost thousands less starting at a base price of between $75,000 to $85,000. This is WONDERFUL NEWS! We look forward to seeing everyone at the Detroit Auto Show in mid January 2005 where we can hear our "HERO" Chief Engineer David Hill give us the true and final low down on this fabulous new chapter in Corvette history!